Starting from Hawne Basin at Coombeswood in Halesowen, this walk follows the Dudley No.2 canal, completed in 1798 to Parkhead Junction and then the Dudley No.1 to Black Delph where the Birmingham Canal Navigations end. The basin is in the middle of an industrial estate and the walk begins with a familiar backdrop of factories, passing the imposing remnants of Stewarts and Lloyds, at one time a major user of the canal, employing a large fleet of boats to transport their tube products. Gosty Tunnel (557yds) has no towpath, so from the South East portal follow the road to the other end, passing a ventilation shaft bizarrely located in someone's front garden and The Boat public house. An old structure but modern landmark is Primrose Bridge notable for Albion supporters as it carries a plaque commemorating Jeff Astle aka 'The King', and the graffiti artists who continually painted his name on the brickwork. After Primrose Basin and the Lodge Farm Reservoir the atmosphere is very nearly rural. The reservoir was constructed at the same time as Brewins Tunnel in 1838 when the canal was straightened. In 1858 the tunnel was opened up and Highbridge that towers over it was built. For a change the canal is dead straight as you get to Blackbrook Junction and bear right over the unfortunate Two Lock Line Canal that collapsed into a mine shaft. Before Parkhead Junction, look out for the plaque commemorating Grazebrook's Iron Works which made casings for the dambusters' bouncing bombs. The Dudley Canal Trust is housed at Blowers Green Pump House and it is here that the No.2 canal meets the No.1, and after the two Blowers Green locks were made into one, it became the deepest lock (12ft) on the BCN. Take a right here, ascending 20ft to the Wolverhampton Level through three locks, under the disused Parkhead Railway Viaduct, passing the Pensnett Canal and Grazebrook Arm, and onto the south portal of the 3154yds Dudley Tunnel. Officially opened in 1792, an incredible 41,000 boats used the tunnel in 1853 and in 1858 the Netherton Tunnel was constructed to ease congestion. Like other tunnels it suffered subsidence but has been restored and, together with the derelict locks, re-opened in 1973 but there is no towpath. Returning to Blowers Green you go onto the the Dudley No.1 canal under the quaintly named Dudley and Lye Waste Bridge, and the fairly grim landscape becomes typical of a post heavy industrial area. However, half a mile after crossing Woodside Junction with the former Two Lock Line, the scene is transformed by the rather splendid Brierley Hill Waterfront development, a business park built on the site of the Round Oak steelworks which, although still profitable, closed after 125 years of production in 1982. A bit further on Merry Hill appears with a zillion cars and shoppers. Its construction neccesitated the canal to be slightly realigned in 1997-8 and fairly briskly you reach Delph Top Lock. 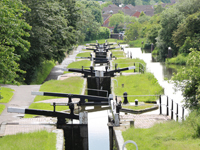 The flight is certainly an arresting sight, originally nine locks, they were reduced to eight deeper locks in 1858. The bottom lock marks the end of this part of the BCN and the start of the Stourbridge Canal.